I am beyond thrilled to get to participate in the cover reveal of The Prophecy, debut novel by Erin Albert, being released on November 15, 2013! Growing up on a small farm in the kingdom of Vanguard, seventeen-year-old Layla Givens lives a deceptively tranquil existence, working very hard to keep her true identity hidden. But her carefully constructed life falls apart when she’s abducted by a religious zealot who proclaims her The Fulfillment of an ancient peace prophecy and whisks her away to marry her greatest enemy. When Nash's secret is revealed, a firestorm sweeps through both realms, with Layla at the very center. Now she must choose between duty and desire while the fate of two nations hangs in the balance. Erin Albert is an author, editor, and fitness trainer. Since she picked up Morris the Moose Goes to School at age four, she has been infatuated with the written word. She went on to work as a grammar and writing tutor in college and is still teased by her family and friends for being a member of the "Grammar Police." In her free time, Erin enjoys acting, running, kickboxing, and, of course, reading and writing. Her favorite place to be is at home with her family and easygoing tabby cat. 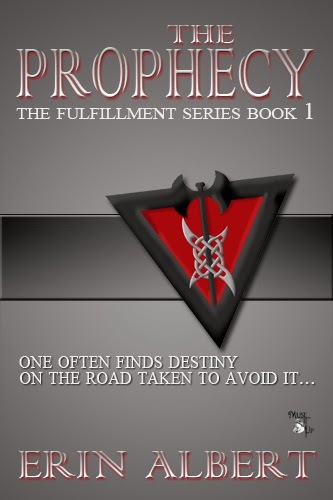 The Prophecy is now available for Preorder! and visit her website www.erinalbertbooks.com. You can grace my blog any time you wish, Ms. Albert! Go forth and knock everyone's socks off on November 15, Erin! Love the cover Erin and thanks Jay for sharing!